Unreal Estates is a group exhibition of newly commissioned painting and writing, taking place this September in a working estate agency in Dalston. Curated by local artist Amanda Lwin, six London-based painters are producing new work in collaboration with a fiction writer. 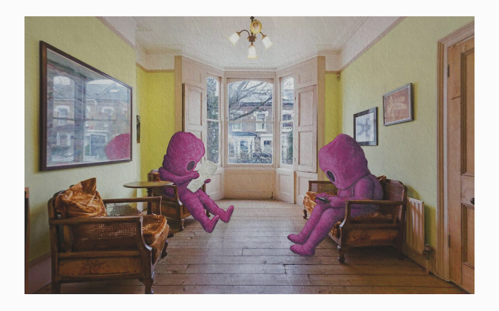 Each pair are working together to create an interpretation, story or narrative about the listed properties in the estate agency, expressed through a series of paintings and a short text. Gathered together as Unreal Estates, the work loosely resembles property marketing material. The show is inspired in part by the concept of ‘Airspace’ in an essay written by Kyle Chayka; the idea that interiors are becoming more and more homogenised due to our fascination with ‘apartment-lust’ on apps like Airbnb, Instagram and Pinterest. The works are a subtle comment on the state of the property market and the trend of property as investment, rather than a place where lives are lived. The work reasserts the subtleties, emotions and intrigues found in domestic settings with richer, deeper stories. A nuanced examination of issues affecting London and other cities, Unreal Estates reaffirms the basic human need of a house as shelter; a space of personal rather than of monetary value. The value of property exists in collective fictions and political decisions as much as in reality. Rather than simplistically demonising the profiteers of the housing crisis, the exhibition targets the systemic nature of the commodification of property. Everyone is complicit from mortgage providers and property agents to homeowners and even renters. Envisaged as a project that will tour to other cities in the UK, with local artists and writers working on each new iteration, the project is being recorded on theUnreal Estates website. Following the same logic as the exhibition, the website mirrors that of an estate agent’s. Amanda Lwin is a British-Burmese artist and curator. She grew up in Beckton, East London and now lives and works in Hackney. With a background in architecture (Cambridge University) her interdisciplinary work focuses on cities, buildings and landscapes. Her latest work, A Worldwide Web of Somewheres, is on display in Leadenhall Market in the City of London as part of Sculpture in the City 2018. Hannah Bays graduated from the Royal Academy Schools 2015 and lives and works in London. Exhibitions include V22 Young London 2018, If you can’t stand the heat Roaming Projects, London, 2018, RRU residency exhibit, The Bluecoat, Liverpool, 2018, Mall malaise, Kings Mall Hammersmith, London, 2017, and Eton College Artist in Residence, 2018. Hannah Bays has work in a number of collections and won the Jerwood Purchase prize in 2014. Dawn Beckles is a painter based at Wimbledon Studios, graduated from the Cass School of Art. Originally from Barbados via Preston, Lancashire, she has exhibited at art fairs in London and internationally. Her work has to be seen in the flesh to be appreciated: paintings often employ a ground of fluorescent colour which illuminates and intensifies the vibrancy of the scenes. Exotic flora, fauna and foliage inspired by the landscape of her native Barbados are juxtaposed with everyday objects and roomscapes to create interiors saturated with colour. Elysia Byrd is a painting graduate from Wimbledon College of Art. She has been selected for the Woon Prize and FBA Futures. Her first solo show, Pods, Pom-Poms and Other Souvenirs was at Block 336 in 2016. She has travelled extensively and undertaken residencies in places as contrasting as Leipzig and the jungle of Alto Paraiso in Brazil. Her travels build experiences like a map; memories on top of other memories, merging together to form new truths translated into paint. Fairy tales and storytelling are inextricably bound to her practice. Writing her own stories, scribbled down in rapacious moments, where the thought seems so fleeting it may be lost. Though saccharine environments which appear enticingly innocent at first, many of the paintings carry sinister undertones. Héloïse Delègue is a Parisian painter who graduated in 2012 with a BA in Visual Arts from the Sorbonne University in Paris and a 2018 graduate of the MFA programme in Fine Arts at Goldsmiths. She has been exhibited internationally in New York, London, Luxembourg, Hangzhou, Rio de Janeiro and Gothenburg. Exhibitions include Scopophilia at Deptford X Gallery (solo), Trading Rites at Peter Van Kant, Body at Kristin Hjellegjerde Gallery, Vulnerability Room at GIBCA Extended, Tribulations at GKA Gallery (solo), Lacey Contemporary Arts Prize, Caiger Contemporary, Largo das Artes Contemporary Art Center, CI Gallery, Glyndebourne Gallery, Angel Orensanz Foundation. Brian McKenzie is a tutor in printmaking at Morley College, London. Aside from his artistic practice, he was previously Head of Paper Conservation at the Tate Galleries and at the Greenwich Maritime Museum. McKenzie, from Melbourne, Australia, originally trained in engineering, graphics and eventually art conservation, before moving towards contemporary art practice and becoming a course leader at adult learning institution Morley College in 2005. He specialises in highly detailed etchings, richly inky drypoints and moody monotypes, hoping to encourage viewers to ponder deeply about their visceral, essential nature. Anna Jung Seo is a graduate of the Turps Painters Studio Programme, BA Fine Art from the City & Guilds Art School, and a former Florence Trust resident. In 2017, a Turps Painters open studios led to an invitation for her solo show, Unfinished Street Magic at Stone Space. She has exhibited in London and abroad; her works have been selected for various shows including the RA Summer Show, Discerning Eye, FBA Futures 2018, Lynn Painter-Stainers Prize, Sluice Art Fair and the Ruth Borchard Self-Portrait Competition. Her painting focuses on psychological and emotional distance in everyday lives and spaces. Originally from Korea, she also holds a PhD in French Literature. Martin Jackson is a British writer now based in Berlin. In 2017-18 he wrote a ‘live’ poetry collection in Google Docs funded by the International Literature Showcase. His 2013-14 project as ‘writer in residence’ of Google Maps was funded by Arts Council England and featured in 3:am Magazine, Frieze, WIRED, Dazed and elsewhere. In 2011 his poetry received the Eric Gregory Award. Currently, he is working on a series of short stories, for which he was awarded a two-month residency by Can Serrat in Spain. London native John Z. Komurki has lived in Colombo, Barcelona, Mexico City and Berlin. An editor, author and translator of contemporary Mexican poetry, he was founding editor of Mexico City Lit and is currently editor of the Berlin Quarterly. His books on DIY print culture and analogue technology have been translated into four languages. He is co-curator of the Risofest exhibition concept, held so far in Paris and Berlin, as well as Print as Practice, a roundtable series that brings together print-based projects from around the world. Karina Lickorish Quinn is a Peruvian-British barrister turned writer pursuing a Phd in creative writing, focusing on transnational experiences and the impact of space and place on identity formation. Oögenesis was shortlisted for The White Review short story prize and highly commended for the Manchester Fiction Prize. Spanglish, was published by Asymptote in July 2016. Karina also teaches creative writing as a sessional lecturer at Reading University.